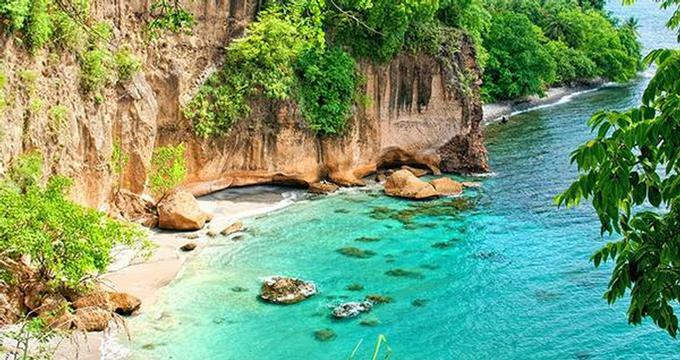 Secret Bay is a secluded hideaway on Dominica in the West Indies, a perfect honeymoon destination for couples who like to explore the outdoors. Guest accommodations have incredible views from their clifftop location. Two awesome beaches, Secret and Tibay Beach, are right next to the hotel. The villas and bungalows and eco-friendly and the architecture blends with the tropical Caribbean island surroundings. Spend your honeymoon exploring the island shores and the mountains. Kayak to the deserted Prince Rupert Bay, visit Cabrits National Park, view Indian River and the Northern Forest Reserve. The restaurant serves fresh locally-grown food, such as freshly-squeezed juice, home-made bread and Mahi Mahi fish. If you want to bring some of these amazing flavors home with you, the hotel offers cooking classes in a fully-equipped kitchen, combined with fun trips to the daily markets at Portsmouth or Roseau. Time your arrival and departure so that you can visit the local market on a Saturday, the best day of the week for shopping. Honeymooners can request fully catered meals from the hotel's personalized cooking service. Choose from homemade pancakes or eggs for breakfast, a romantic picnic for lunch and a mouthwatering dinner. Dominica is a hidden paradise in the Caribbean, with lush valleys, waterfalls, hot springs and pristine, uncrowded bays. Visit the second largest boiling lake in the world, hike up a dormant volcano and explore black and white sand bays. Most of the island has been given the UNESCO World Heritage status and is a paradise for outdoor enthusiasts. Dominica is one of the largest islands in the Caribbean and the least populated. It's home to many different species of plants and animals which can't be found anywhere else. Bungalow rates start from $250/night. Villas from $430/night. Browse more island trips and packages.